L’Occitane en Provence and commonly known as L’Occitane is an international retailer of body, face, fragrances and home products based in Manosque, France. The company was founded in 1976 by Olivier Baussan with the purpose to create a company that celebrates and preserves the traditions of his native Provence. The company name means “the Occitan woman”. In 2010, the company became listed on the Hong Kong Stock Exchange. 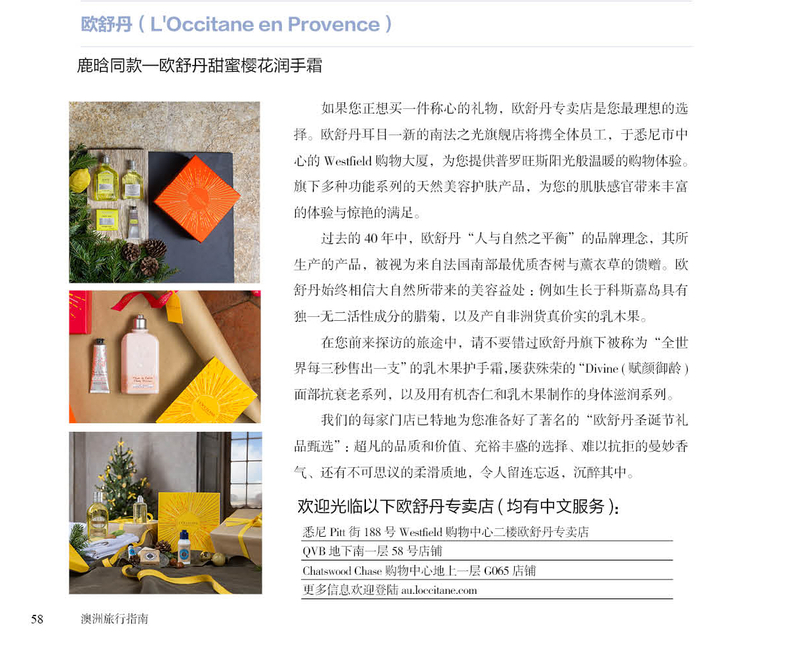 L’Occitane started Australian Travel Guide campaigns with Connect China since November 2018. To better promote L’Occitane’s Westfield and QVB stores (the two most popular shopping spots for Chinese tourists), L’Occitane ran a 1/2 page campaign from November 2017 to January 2018 by advertorials to tell their brand story. During the campaign period, over 240,000 Chinese tourists were engaged with L’Occitane’s brand information in hotels and tour buses.